Kyle Willoughby is back! 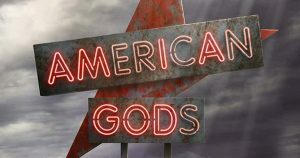 He joins Claire White to discuss the Starz television series, American Gods, based on the acclaimed bestselling novel by Neil Gaiman. Claire considers Gaiman’s idea that America “eats other cultures”, and uses this thought to begin a discussion of the American Dream and what makes America distinct as a country. In the production segment, Kyle decides that although it’s necessary to talk about the showrunners, Brian Fuller and Michael Green, it’s more rewarding to talk about the brilliant Neil Gaiman and how the novel American Gods fits into his diverse career. Our hosts conclude with a discussion of the show’s first three episodes and their favorite works by Gaiman.